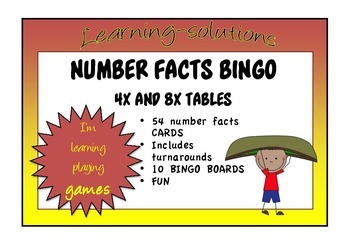 I developed this game when I could see that my kids who knew the 4x table needed more help to learn the 8x. I wanted a game that would show them the patterns they could use and transfer. I added the multiples ladder to each side of the board (see PREVIEW). I use this game (and the ones like it) in Intervention Sessions. I start or end the session with fun that teaches. My sessions are very intense as they target the skills my students need, so a bit of fun at the beginning or end relieves the pressure. I truly believe that a student's frame of mind has a huge influence on their ability to learn. Games give students a positive experience. They learn while they're having fun. This game can also be used as a whole class activity with groups. There are 10 boards, so you can cater for up to 30 students with 3 in each group. Each player would have 3 counters to place on their board. You can mix ability levels in groups and this is inclusive practice at its best. Laminate the cards and boards and you will be able to use this game over and over and over.